It is now half a century since the habitat of the Asiatic Cheetah has been reduced to the Iranian plains. Outside of Africa, the Iranian plains are the only place where cheetahs can be found. The ninth annual festival of Cheetah Conservation Day is being observed, even as estimates indicate that only 40 to 70 head of cheetah are left in Iran. The festival is being held from August 27 to 28 in Tehran's Mellat Park in tandem with celebrations in 13 other provinces. In an interview with Radio Zamaneh, festival secretary Farnoush Kochali said the event has been held since 2007 with the aim of familiarizing children with the animal and grooming them to be the next generation and future guardians of the environment, including the Iranian cheetah. He added that there will be several booths at the festival venue, most of which belong to the Iranian Cheetah Association, providing educational material. A similar message will be presented through plays, storytelling and dance performances aimed at children. Iran's cheetah conservation program, supported by the United Nations Development Program in collaboration with Iran's Department of the Environment, began in 2001. Many national and international groups have cooperated with the program to ensure the long-term survival of the Asiatic cheetah in Iran. 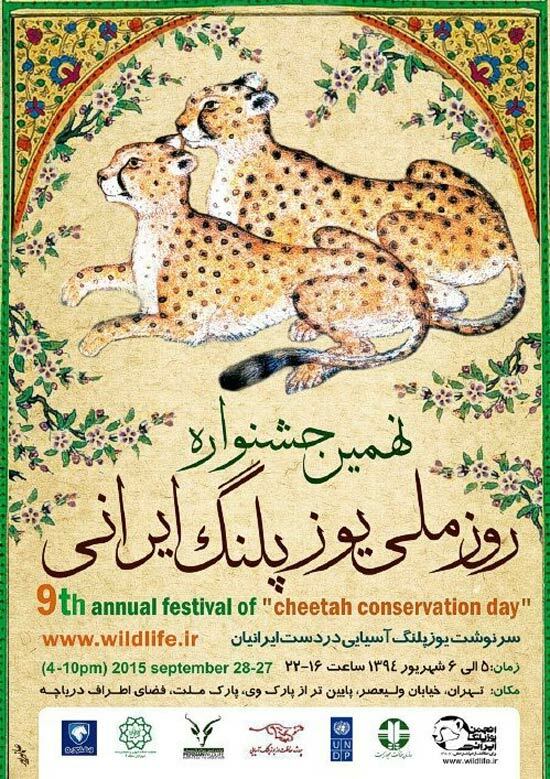 In 2006, August 31 was named as the National Day of the Iranian Cheetah. The costs for the festival are completely covered by the Association for the Protection of the Iranian Cheetah, an independent non-profit organization. The Iranian cheetah, which is distinguished from its African cousin by its mane, has been seriously threatened in the past decades by continual encroachment on its habitat. The Iranian cheetah is found in 10 parts of the country, mostly on the edges of the central desert, including Khartouran, Naybandan, Dareh Anjir and Miandasht, which are now listed as protected regions by the Department of the Environment. The National Touran Park in Semnan is one of the chief habitats of the Iranian cheetah, with close to 14 head of cheetah. In Naybandan, another 12 cheetahs have been recorded and in Kavir National Park between Semnan and Isfahan, four to six cheetahs have also been recorded. While earlier estimates indicated the number of cheetahs to be between 70 and 120, more recent counts put the number in Iran closer to between 40 and 70. In the past decade, 270 cheetahs were killed by contact with humans, 110 of them in road accidents. Seventy-one cheetahs are said to have been killed by humans just in the past four years. Reports indicate that while road accidents are responsible for many of these deaths, illegal hunting is also a chief contributor to the decline of Iran's cheetah population. The Department of the Environment recently made significant increases to the fines for illegal hunting to discourage poaching. The fine for hunting the cheetah in Iran has increased from five million toumans to 100 million toumans. In July, the UN Development Program and the Iranian insurance company Dana announced another step in trying to preserve the Asiatic cheetah, using insurance coverage provided by Dana to mitigate threats against the cheetah in Iran. According to the initiative, Dana Insurance provides 50 million toumans to the project each time a cheetah is killed in a road accident or by herd dogs. The money would be used to reduce the threats that killed the cheetahs in the first place. The plan covers five cheetah deaths per year. The number of cheetahs in the entire word has declined by 90 percent in the past century. The number of cheetahs in the entire word has declined by 90 percent in the past century, and estimates indicate that there are only 10,000 head of cheetah left in the world. The cheetah is also threatened by a lucrative trade in smuggling the African cheetah to Arab countries around the Persian Gulf, where a head of cheetah can be sold for up to 10 thousand dollars to be kept as a pet.